The nine pavilions provide an environmentally sensitive and architecturally innovative accommodation offering. 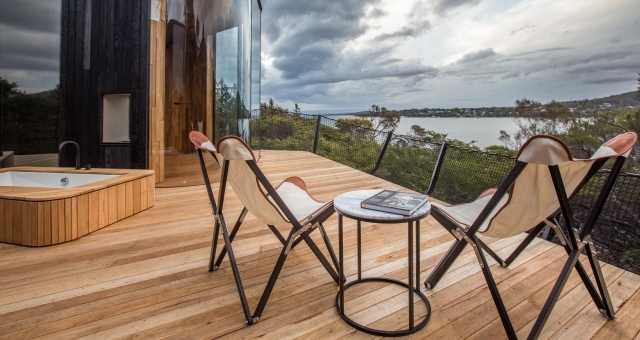 Designed by an experienced consultant team led by well-known Tasmanian tourism developer Brett Torossi and Liminal Architecture, and built by Tasmanian company Cordwell Lane, they nestle gently along the coastline of Great Oyster Bay. 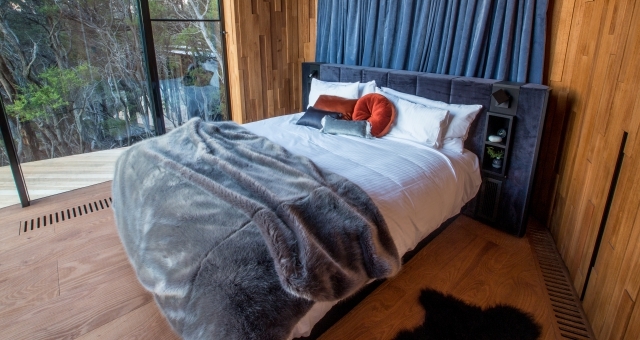 The use of curved glass, Tasmanian timbers and tactile finishes adds to the immersive experience. 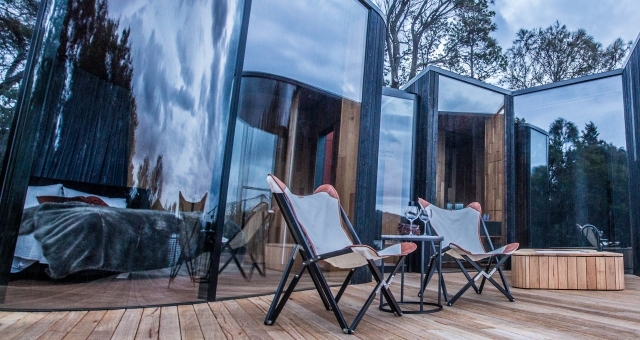 Each pavilion was built mainly off-site, with the components transported into the Freycinet National Park and custom-fitted to the landscape. Outdoor baths on the deck and separate lounge spaces, both taking in the view, will enhance the guest experience. Each of the nine pavilions has its own unique character. Some sit overlooking the waters of Great Oyster Bay, while others nestle gently within the bushland, with filtered coastal views. The works of local artists, commissioned especially for this project and inspired by the nature of the peninsula, are featured on the walls of the bedroom and lounge. Locally made furnishings have also been purpose-built to reflect the surrounding natural elements. The baths are embedded outside on the deck, overlooking the natural surrounds – the perfect place to relax after a day of exploring the bushland, mountains and beaches. And the cleverly designed showers also take in the view, while maintaining guest privacy. Guests will enjoy everything Freycinet Lodge has long been known for – amazing natural vistas, local wildlife, quality local food and wine and friendly, personal service. Taking it to the next level will be some added extras, such as a bottle of Tasmanian wine and house-baked treats on arrival; a nightcap and chocolates waiting in your pavilion after dinner; the option of a continental breakfast hamper delivered to your pavilion; and a choice of three Tasmanian-themed dinner platters that can be delivered to your room.